I'm sure by now you've at least heard about using essential oils even if you aren't actually using them yourself. I am one that's both heard of them and uses them personally. There are some that I actually carry with me everyday in my purse because I swear by them for certain ailments. I can attest that yes they do work since I've used them myself. 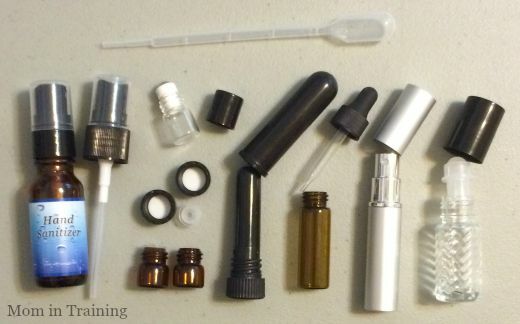 As part of using essential oils you also need some essential oil gear as I like to call it. A place you can shop for all of that in one simplified website is My Oil Gear. My Oil Gear is an online store where you can shop for things like various sizes and styles of glass bottles, nasal inhalers, glass water bottles, pump bottles, disposable pippets, carrying cases, veggie capsules, labels, and diffusers. Wow that was a mouthful. Needless to say they carry pretty much everything you would want to share your oils, and to get the maximum use out of them when making oil blends. So far with my sample bottles I've done a hand sanitizer in the spray bottle, a roller bottle with lavender in it, the sprayer with bug repellent blend, the other roller bottle with a respiratory blend, and given away some samples in the small 1/4 dram bottles. Maybe you are new to oils and don't want to order multiple of a particular item because you aren't sure what you really want or need. Thankfully My Oil Gear has even thought of that and has come up with this really nice Sample Bundle 2 to get you started. (also included but not listed is a 1.7 ml pipette) I personally loved this bundle when it arrived. It gave me a good ideas as to sizes of the different bottles and what I could use them for. My photo above actually shows you all of the included products. It's a great variety and it's available at a great price point too! 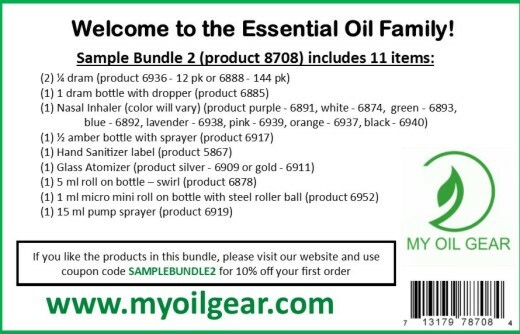 I would highly recommend checking out the My Oil Gear website if you or someone you know uses essential oils. They have good quality products (and I can attest for that personally). I've been using the samples I was sent for about a month now and have had no breakage, leaks, or any other issues with any of them. I've already been making myself a shopping list of other products I want to order so that I can get the best deal on shipping since they ship by order weight. Another added bonus! Buy it: You can purchase these and other products from the My Oil Gear website. And as a special added bonus for you my readers if you use code IHEARTMOG you can get 10% off everything except bundles! Win it: One lucky reader will win a My Oil Gear Sample Bundle 2 (as shown above). This giveaway will end September 17th at 11:59 PM EST. The winner will have 48 hours to respond to my email. If no response, a new winner will be chosen. Prize fulfillment will be made by the sponsor, I am not responsible for prize delivery or lost or stolen deliveries. Open to residents of the US. I like the 360 Greenair diffuser. I like the amber glass bottles. I have a lot of oils and like this case: http://www.myoilgear.com/32-bottle-essential-oil-carry-bag-black-canvas/. I like the My Oil Gear Exclusive Diffuser - Ebony! 16 OZ GLASS BOTTLE W/ TRIGGER SPRAYER - AMBER (SINGLE) is a product I really like! I love the rollerball kids! I like the glass sample bundle. I like the 10 ml Roll On Bottle - Frosted Purple (6 Pack). I've never used essential oils before and I'm excited to try them. Do you sell oils or just accessories? I have an essential oils company that I am affiliated with and that's where I get my oils. If you are interested I can email you the link to my website that has a vast amount of information about the oils and their uses. As for accessories I am just did a review and giveaway for My Oil Business as a sponsor for my blog. I like the Rollerball Mood Series Make & Take Workshop Kit. I like the My Oil Gear Exclusive Diffuser - Ebony.